On any given day, I wish I could retreat for a bit of "me" time, be it curled up with a book, taking a little nap, or just zoning out from the stress of the day. Well, I should have been a cat. Unlike dogs who can spend most of their day playing or basking in their human's gaze, cats need to get away -- from their humans, noise and other cats and household pets. A cat refuge is anywhere the cat is comfortable or surrounded by "his" things, food or water, a litter box, toys, a scratching post or rest area. So, a household rule of thumb -- if the cat retreats, let him. On that topic, a good refuge for a cat is a high perch or observation area. While curiosity may have never actually killed a cat, it is part of a cat's nature to observe. A high resting spot allows the cat to escape while still keeping a paw on the pulse of the household. 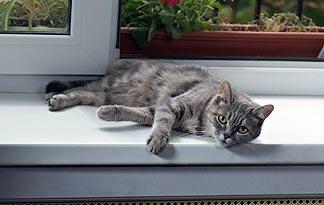 Window sills, stairs, even the back of the sofa are great areas for the cat to have private, observation time. If you're in a one-story home, your cat may get more creative and find a spot on tops of cabinets or shelves; you can even purchase a multi-level kitty condo or play structure from a pet store. This will give your cat a play area, scratching post and area of refuge, all in one stop.